You are currently browsing articles tagged VA privatization fight. 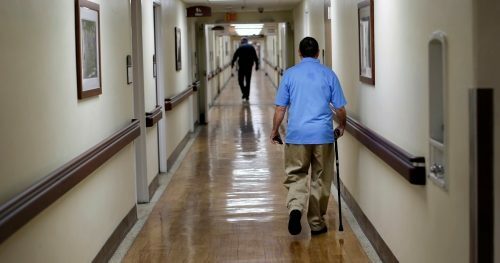 WASHINGTON — Veterans Affairs officials are touting a new study praising VA hospitals for outperforming most private-sector medical options, but rejecting the authors’ conclusions that the findings undermine the administration’s support for shifting more veterans care into the private sector. The study, conducted by Dartmouth College researchers and published in the Annals of Internal Medicine this week, looked at 121 regional markets with at least one VA facility and found the department-run medical center provided better care than private options in most cases. In only a few cases, VA was the least desirable option for most patients. VA hospitals were frequently the best option for patients in treating heart ailments and pneumonia. They study also rated more than half of the VA hospitals reviewed as the best local option for death rates among patients with surgery complications and treatment of bloodstream infections after surgery. But in a press release lauding the study, VA officials also attacked authors’ analysis that questions whether expanding more access to private-sector physicians for veterans will produce better health care for the population. President Donald Trump has repeatedly promised to make accessing outside medical care easier for veterans, a prospect that critics have called the gradual privatization of VA’s mission. Last summer, lawmakers passed the VA Mission Act, which among other initiatives mandates an overhaul of the department’s community care programs. Department officials are in the process of rewriting rules for veterans to receive medical treatments outside the Veterans Health Administration while still using taxpayer funds. Fear no longer. Be the first to hear about breaking news, as it happens. You’ll get alerts delivered directly to your inbox each time something noteworthy happens in the Military community. Wilkie is expected to testify on that work so far at a joint House and Senate Veterans’ Affairs Committees hearing Wednesday. On Thursday, department officials argued that VA hospitals providing exemplary care does not mean that community care options are less important to the larger department health care plans. “(The study) ignores the fact that for decades (community care) has served as a vital tool for ensuring VA has the ability to provide veterans the best, most timely health care possible, and that it enjoys strong bipartisan support,” the release stated. A Wounded Warrior Project membership survey released earlier this month noted that more than two-thirds of responded preferred VA as their primary health care provider, citing in part more confidence in those physician’s expertise in handling military-specific wounds. That group has also seen an increased reliance on the VA system for serious health needs. More than 70 percent of those polled used VA mental health services in the last year, up from 63 percent four years ago. Democrats in the House have promised close scrutiny of the new community care rules — due this spring — to ensure that VA funding isn’t being shifted outside the department’s system to private-sector physicians who provide a lesser quality of care. Reporter Natalie Gross contributed to this story. text, email, or phone call! Hurricane Michael has caused catastrophic damage and impacted millions. Get information on how to receive aid or how to make a gift to help veterans and their families in need.